When I was a teenager I went blueberry picking with my mother. When we came home with our buckets full of gigantic blueberries, the first thing we made was blueberry pancakes for dinner that evening. 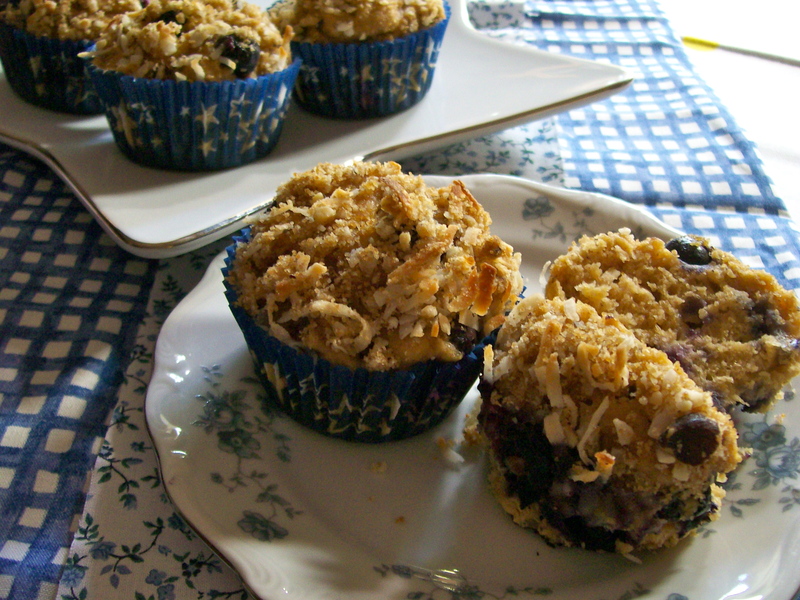 The second thing we made were these blueberry muffins. I think they were the first item I learned to bake. I have never deviated from this recipe even though I have looked at many others over the years. They are just sooo good, and they taste like home. These muffins are so easy to make; no beater is involved. They are made completely by hand. Just measure everything out, whisk together the dry ingredients, whisk the liquids, add the sugared berries, and fill your muffin tins. Bake and be sure to have at least one while they are still warm. I like to have some butter melted and ready when they come out of the oven, and a little cup of sugar. Then I dip or brush butter all over the top of each one, and sprinkle on the sugar. Mmmmm, Mmmmm. 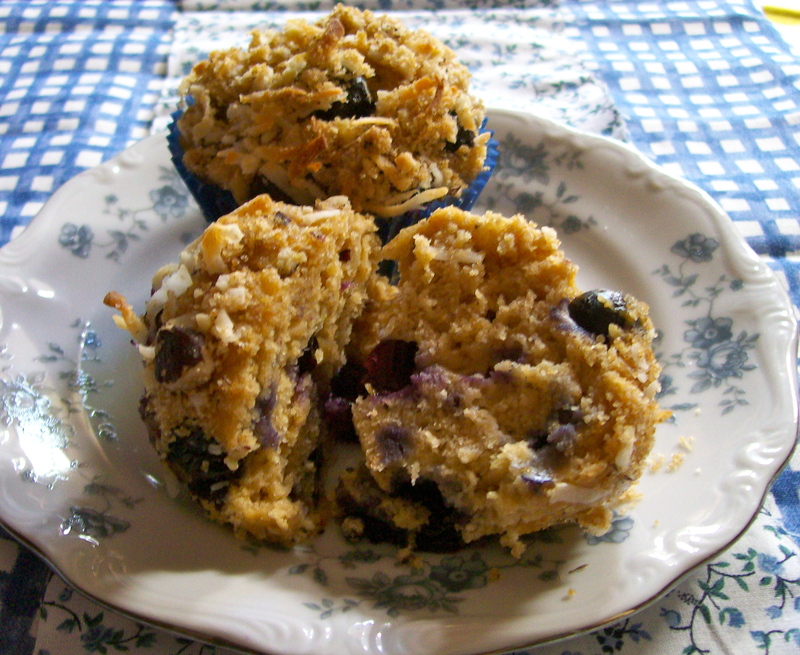 Most likely everyone already has their favorite recipe for blueberry muffins, but I’m sharing mine with you in case you don’t. What makes these muffins a little different from others is the lemon-sugar that coats the berries before they are folded into the batter. 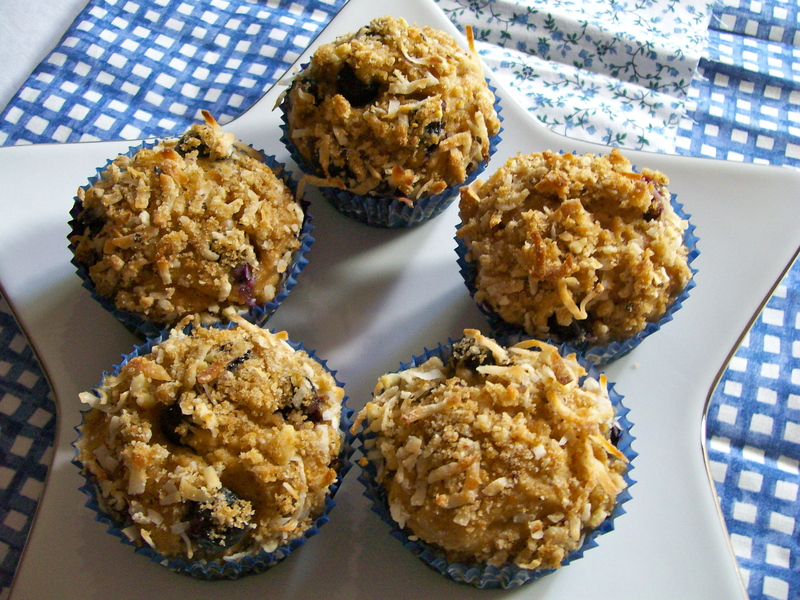 Lemon with blueberries is such a wonderful taste combination, and it really works to great advantage in these muffins. Give them a try and compare to others you’ve made. Blueberries and lemon—made for each other. 1. Preheat oven to 400*F. Line a muffin pan with paper liners, or grease well. 2. Whisk together the flour, 1/4 cup sugar, baking powder and salt in a mixing bowl. 3. In another smaller bowl, whisk together the milk, egg, and oil. 4. Make a well in the flour mixture and add the egg mixture all at once. Stir quickly just to moisten. There may still be some slumps. 5. Mix together the lemon peel with the 2 Tbsp. sugar, add the damp berries and toss to coat. Stir gently into the muffin batter. 6. Fill the muffins cups–they will be quite full. Bake at 400*F for 25 minutes. Remove from oven when they are golden and test done. 7. While still warm, brush tops with melted butter and then sprinkle with extra sugar. Brush tops with melted butter and sprinkle with sugar. SOURCE: An old recipe from my recipe box. Everyone loves blueberry pancakes, and this is the time of year when blueberries are readily available, so maybe your family is asking for their favorite pancakes right about now. Which is why you run into a supply and demand problem, standing over a hot griddle flipping one after the other. Usually the one who is doing the “flipping” is the last one to get to eat, and hopefully there will still be one or two hot ones left for when the cook gets to have theirs. I’ve been in that situation, and even though I preheat the oven and put some of the pancakes in there to keep warm, when I get to sit down to eat they are never quite the same as getting some hot off the griddle. This recipe for an oven-baked blueberry pancake is meant to take the pressure off since you just mix and pour the batter, then pop it into the oven. It has all the tender texture of old-fashioned flapjacks, but it slices into wedges so everyone can eat together–and you don’t end up feeling like a short order cook. In the unlikely event that there is some left over, it does reheat well in the microwave for a special breakfast treat before starting your weekday morning, or have it for lunch with some additional fruit. 1. Preheat oven to 375*F with rack in upper third. Place a 10-inch cast-iron skillet ( or other nonstick ovenproof pan) in oven. 2. Whisk together flour, 3 tablespoons granulated sugar, baking powder, and salt in a bowl. Whisk together milk, egg, and melted butter in another bowl. Whisk milk mixture into flour mixture until just combined. 3. Remove skillet from oven and add 1 tablespoon butter, swirling to coat. Pour in batter and smooth top with a spatula. Sprinkle evenly with blueberries and remaining 1 teaspoon granulated sugar. 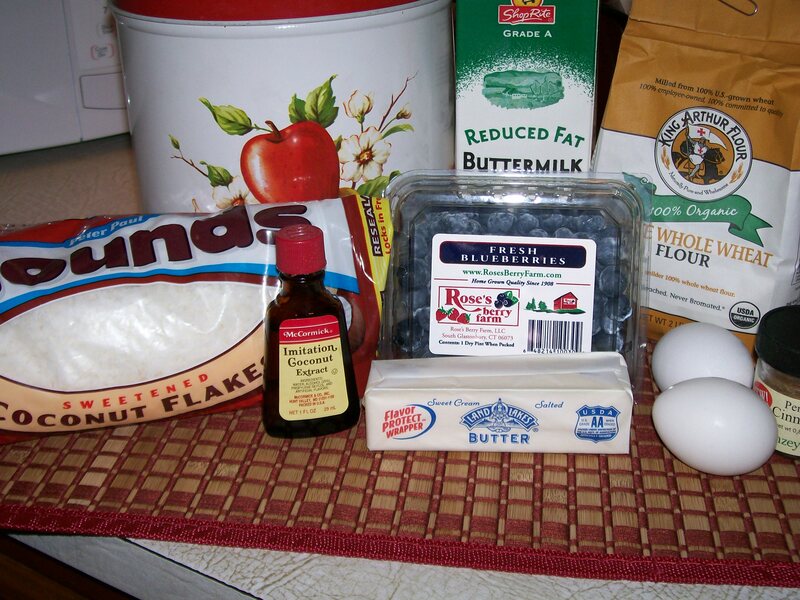 Sprinkle with blueberries and 1 teaspoon sugar. 4. Bake until golden brown and cooked through, about 25 minutes. Remove from oven, let cool 5 minutes before dusting with confectioners’ sugar and serving with syrup. This is an experiment in cutting back, using less, leaving out, and just generally leaving things alone. You know that when I cook I try to cut back on ingredients that are unhealthy or not good for us, but when it comes to the “good” stuff, well…..that’s another story. My philosophy is usually “more is better”. Today’s baking session went something like this. I made Blueberry Zucchini Bread, without adding bacon, without lemon zest, without ginger, without crumb topping, without coconut, without chocolate chips. Oh, the more I mention, the more I want to put into this luscious breakfast bread. I keep telling myself, “no, just let it be what it is”. So, Ok, I added blueberries to zucchini bread, but you know, a green veggie is kind of boring, and blueberries are so pretty, and good for us, (antioxidants and all). You’ll be so glad I did all this for you. The resulting bread is just right for breakfast, not too sweet, yet moist with tons of flavor. Many zucchini bread recipes in my cookbooks seem to call for 1 cup or more of oil, and are also too sweet for my taste, so thinking that the moisture added to this recipe by the zucchini and blueberries would compensate, I reduced the amount of oil to 2/3 cup, and used only 1 cup of sugar instead of two cups as the original recipe called for. Thus you have less is more. Less of the unhealthy and unnecessary ingredients and more of the healthy ingredients that are better for you. Picky eaters at your house? I’ll bet they’ll be scarfing down this one! 1. Preheat oven to 350*F. Lightly grease loaf pans. See conversion list for pan sizes. 2. In a large bowl, combine flour, salt, baking powder, baking soda and cinnamon. In another bowl, beat together the eggs, oil, vanilla, and sugar. 3. Stir flour mixture into egg mixture and combine until well blended. Add dry ingredients to egg mixture. Stir in zucchini, then gently fold in blueberries. Stir in zucchini, then blueberries. Batter will be thick. Pour batter into prepared loaf pans. Note: if using small pans, set them on a baking sheet for stability in and out of the oven. Pour batter into loaf pans set on a baking sheet. 4. Bake at 350*F. for 50-55 minutes or until a toothpick inserted into the center comes out clean. 5. Cool in pans for about 20 minutes, then turn out onto a wire cooling rack to cool completely. Wrap in foil to freeze if desired. These rise nice and high. Notes from my kitchen: Many times quick breads can be baked in different sizes than the recipe calls for. These are some alternate size pans for when a recipe is based on 2 1/2 – 3 cups of flour. Keep in mind that baking times will vary, so use a cake tester, and rely on color and your sense of smell. SOURCE: I made some major changes to a basic recipe for zucchini bread that was in my files. Summertime desserts seem to fall into three major categories: cool, frozen concoctions, no-bake pies and such, and fresh fruit delights. Today’s recipe falls into the latter group. Right about now I’m seeing blueberries appearing at the supermarket that are coming to us from California. It’s still too early for East Coast berries to make their appearance, but blueberries hold up fairly well and those arriving here from the West coast are looking good. Although I missed making these bars for Memorial Day, they are good anytime at all, and perhaps for July 4th. 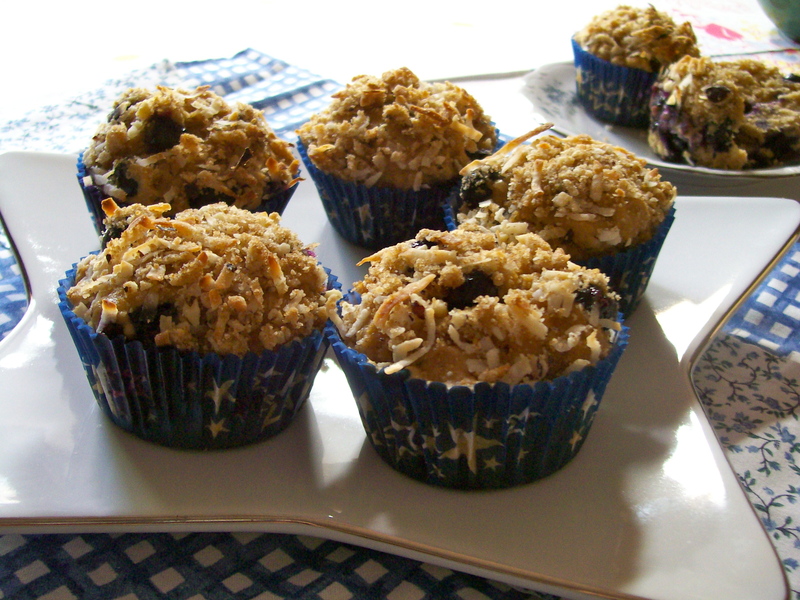 The reason I say that is because with their blue color from the berries and light crumb topping, they have a patriotic color theme, and they certainly speak of summer. These bars are ridiculously good. They are the sort that will make you want to eat the whole pan, and then moan at how good they were. 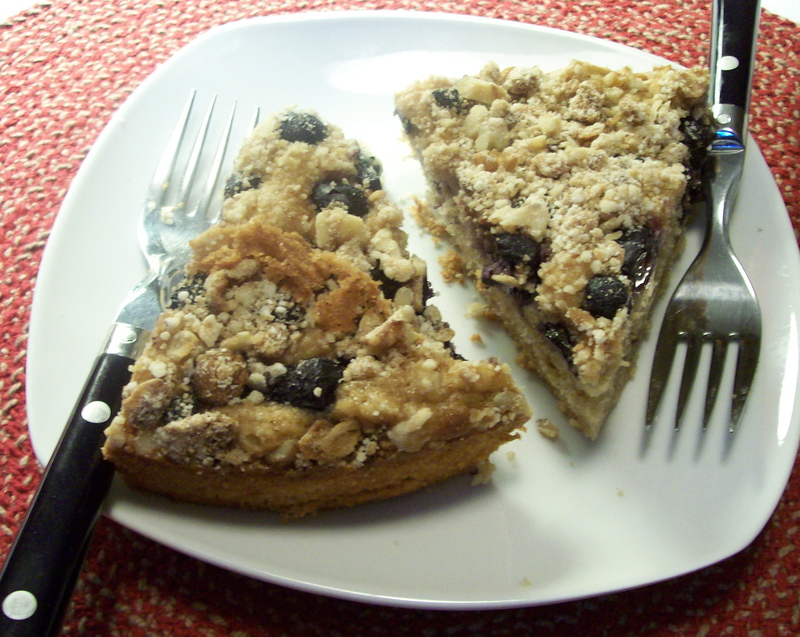 Having tried the recipe as written using blueberries, I would feel confident in changing up the fruit and using a different berry, or in the fall, using sliced apples with brown sugar instead of granulated. This is just what I love, a really good recipe that lets you try it different ways and never lets you down. Whooo-Hoo! From my experience with making these bars, I have two suggestions: use a little more than half the dough mixture for the bottom layer, the bars will cut better and the berries won’t leak through to the bottom. Also, if your berries are a little tart, you may want to add an additional tablespoon of sugar to the berries. 1. Preheat oven to 375*F. Grease a 13 x 9-inch pan. 2. In a large bowl, whisk together the flour, 1 cup sugar, baking powder, salt and cinnamon. Use a fork or pastry cutter to cut in the shortening (or butter). Mix in the egg–dough will be crumbly. Stir egg into dry ingredients. Pat half of it into the bottom of the prepared pan. 3. In another bowl, stir together the cornstarch and remaining 1/2 cup sugar. Gently stir in the blueberries. Sprinkle the berry mixture evenly over the crust. Layer berries over bottom crust. Crumble the remaining dough over the berries. 4. Bake for 40 – 45 minutes, till the top is lightly browned. Cool completely before cutting into squares. This recipe makes the cutest little individual cakes, with a creamy lemon sauce poured over them. More cake-like than muffin and not very sweet they are surprisingly sophisticated for your most elegant summer gatherings. The addition of cornmeal to the batter provides some crunchiness and the zesty lemon flavor combines perfectly with the delicate flavor of blueberries. Slightly crunchy from cornmeal, and studded with blueberries. This is the dessert I mentioned in yesterday’s post that completed the pork tenderloin meal, but I think these would also be great for an outdoor picnic too. Most people seem to enjoy it when they are served their own perfect little cake, so bake these in small custard cups or ramekins that hold between 5 – 6 ounces. To serve them, turn upside down on a serving plate or shallow dessert dish, and spoon some of the lemon sauce over the top. I particularly enjoy them when they are still somewhat warm; or they could be briefly heated in the microwave before serving. 1. Preheat the oven to 350*F. Lightly grease eight 5 to 6 -ounce ramekins or baking cups. 2. Combine the dry ingredients in a large bowl. Whisk together the remaining ingredients except the berries, then stir into the dry mixture until just combined. Fold in the blueberries. Divide the batter among the baking dishes/ramekins. 3. Bake the cakes for 24 – 26 minutes, until the centers are firm to the touch. Transfer to a rack to cool. This recipe for lemon sauce can be made with either water or half milk. The water version has a brighter lemon flavor; when made with milk it’s a little creamier. That is how I made mine. In a medium saucepan, stir together the sugar, cornstarch, salt and nutmeg. Gradually stir in the water and milk, then bring to a simmer over low heat until the mixture thickens and becomes translucent. Remove from the heat. Stir in the butter, lemon zest and juice and serve. SOURCES: For the cakes: King Arthur Flour Baking Co. 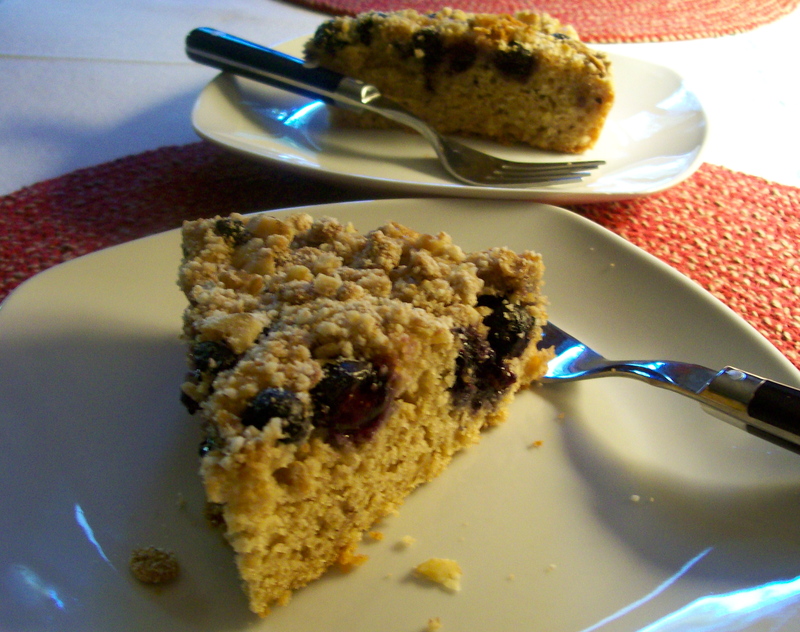 The original name for this recipe was Blueberry Crumb Bread. In my mind breads are baked in a bread/loaf pan. 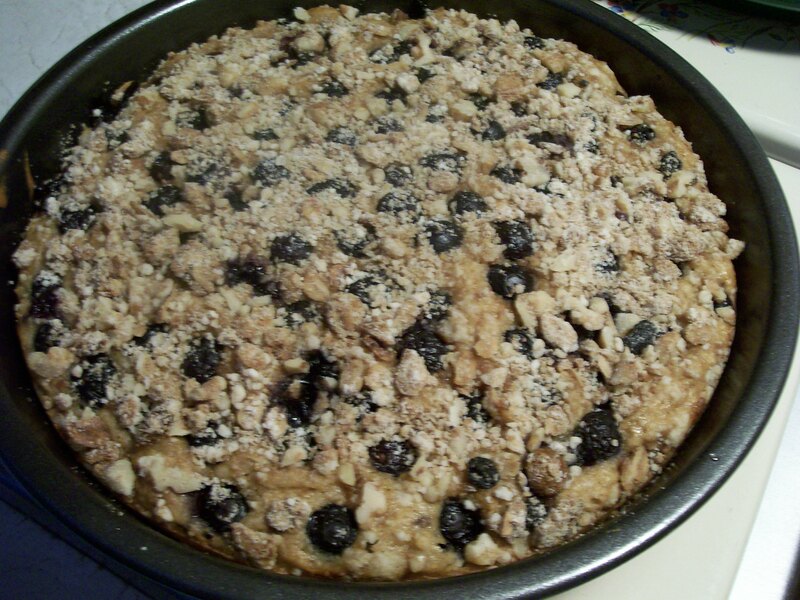 If you bake it in a square or round baking pan, it is no longer bread, but some form of cake. I know, I know, a minor technicality, but to please me I’m calling it cake, because it gets baked in a baking pan. 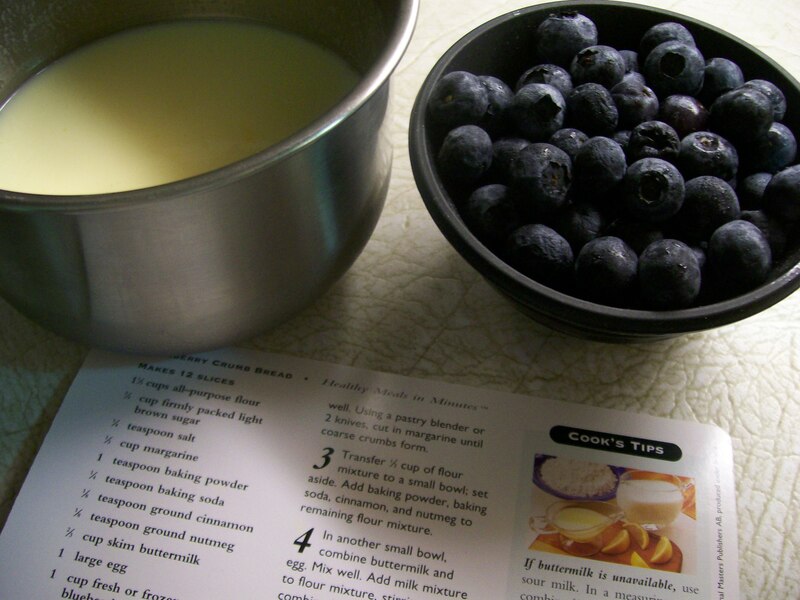 There are many descriptive phrases I would apply to this recipe such as: tastes very good, great for breakfast or brunch, quick to make, good use of blueberries, and good for you. One cup of blueberries supplies 27% of your daily requirement of vitamin E, and contain antioxidants as well. So there is every reason to make and eat this enjoyable “cake”. The day I made it, I baked it late in the afternoon so it was still warm for dinner and we had it for dessert with a scoop of vanilla ice-cream. But hot out of the oven it would be a wonderful addition to your Sunday morning breakfast. 2/3 cup non-fat buttermilk ( No buttermilk? In a measuring cup combine 2/3 cup low-fat milk and 1 teaspoons vinegar or lemon juice. Stir and let stand a few minutes before using ). 1. Preheat oven to 350 degrees F. Spray a 9-inch square or round baking pan with non-stick spray. Flour, salt and brown sugar in the bowl. 2. In a large bowl, combine flour, brown sugar, and salt. Mix well. Using a pastry blender or 2 knives, cut in butter until coarse crumbs form. 3. Remove 1/3 cup of this mixture to a small bowl; set aside to be used for topping. Add baking powder, baking soda, cinnamon and nutmeg to remaining flour mixture. 4. In another small bowl, combine buttermilk and egg. Mix well. Add to flour mixture, stirring until just moistened. Spoon batter into prepared pan; smooth top. 5. Sprinkle the berries over the top of the batter. If necessary, use the palm of your hand to gently smooth the berries into an even layer. 6. Combine the reserved topping and nuts (if using). Sprinkle over the berries. Bake until golden brown and a toothpick inserted in the center comes out clean, about 35-40 minutes. Place pan on a wire rack and cool slightly. The month of July has been declared National July Belongs to Blueberries Month, and July 11 is National Blueberry Muffin Day. So if you guessed that I made blueberry muffins today you’d be right. Now I know you readers are getting and reading this post the next day, but that’s OK since the whole month is devoted to blueberries, and any day you have one of these little gems will be a good day. Whenever I eat one of these muffins I feel like I’ve gone on vacation. They remind me of the Caribbean with their hint of coconut, and I think of palm trees swaying and Hawaiian music when I taste the macadamia nuts. I think you get the picture. I’ve made them many times in the past and I keep coming back to them because they are so good. They taste as good as a cupcake with less sugar, fat and calories and they fit right into my week devoted to berry recipes. Let’s get started making them. Preheat oven to 400 degrees. Coat a 12 cup muffin pan with cooking spray, or line with muffin liners. Combine coconut, 2 Tablespoons flour, 2 Tablespoons brown sugar, and 2 Tablespoons macadamia nuts in a small bowl. Drizzle with 1 Tablespoon canola oil and stir with a fork to combine. Set aside. 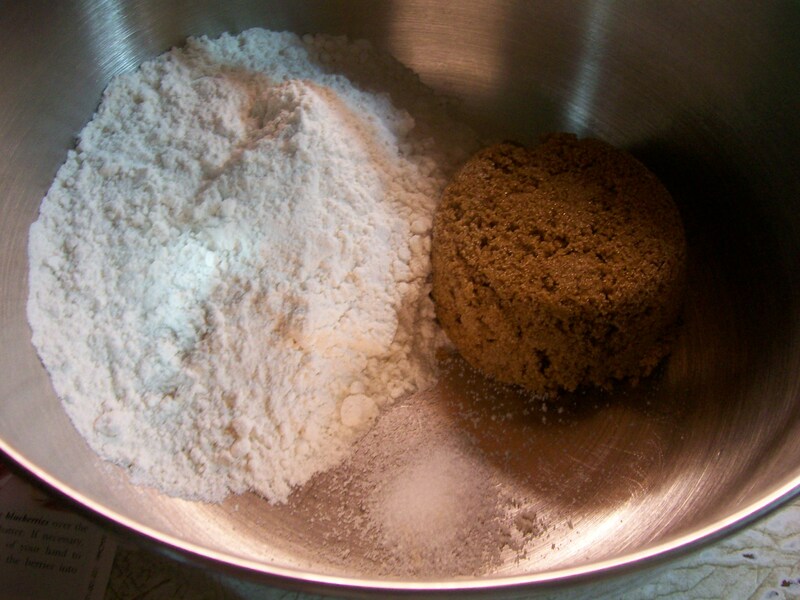 In a medium bowl put 3/4 cup flour, the whole-wheat flour, baking powder, baking soda, salt and cinnamon. Whisk to combine. In another bowl put the 1/2 cup brown sugar, the remaining 1 Tablespoon canola oil, egg and egg white, buttermilk, melted butter, and coconut or vanilla extract. Whisk these together until well combined. Make a well in the center of the dry ingredients and pour in the wet ingredients, stir just to moisten. Stir in the blueberries and remaining nuts. Divide the batter among the prepared muffin cups. Sprinkle with the reserved coconut topping and gently press into the batter. Bake at 400 degrees until golden brown and a wooden pick inserted in the center comes out clean, about 18-20 minutes. Let cool in the pan for 10 minutes, then remove from the pan and let cool on a wire rack. These muffins are wonderful served warm, but can be easily rewarmed in the microwave by wrapping in a paper towel and microwaving on High for 30-40 seconds. They also freeze well.